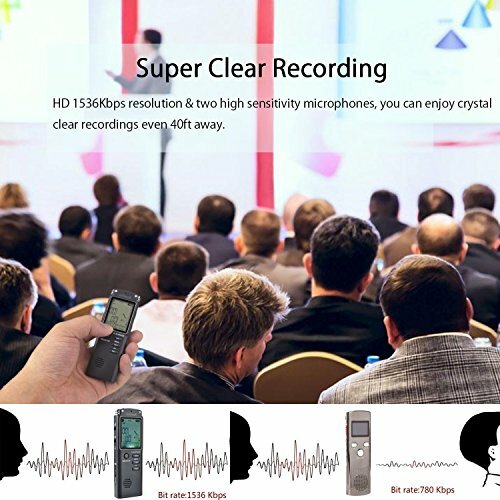 ★ SUPERIOR RECORDING QUALITY: ieGeek voice recorder supports super clear recording with 1536Kbps resolution, 20Hz-20KHz sampling rate and more than 70db SNR, 2 ultra-sensitive microphones with intelligent dynamic noise reduction, you can enjoy crystal clear recordings and playback easily. 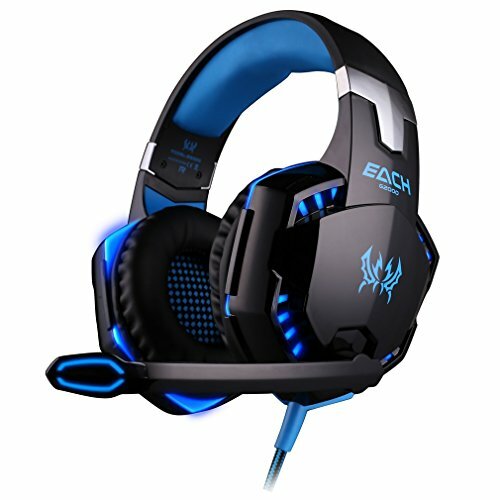 External speakers play HD sound loud and clear. 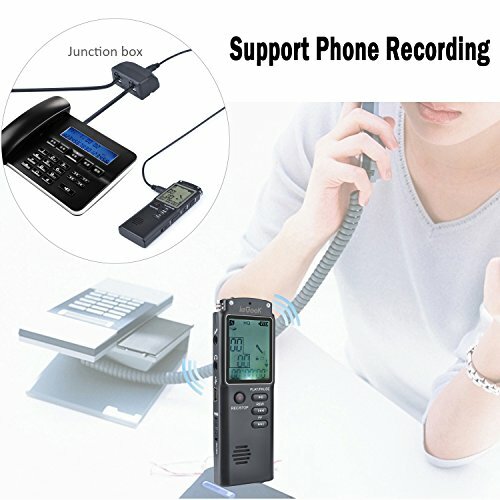 ★ VOICE ACTIVATED RECORDING & PORTABLE: Set it and forget it. 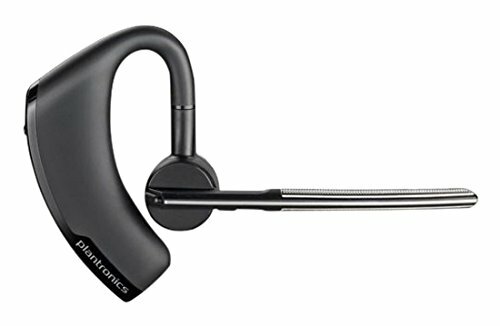 Recording will be automatically paused when no sound and continued when sound is detected, great for hands-free working and saving memory space. 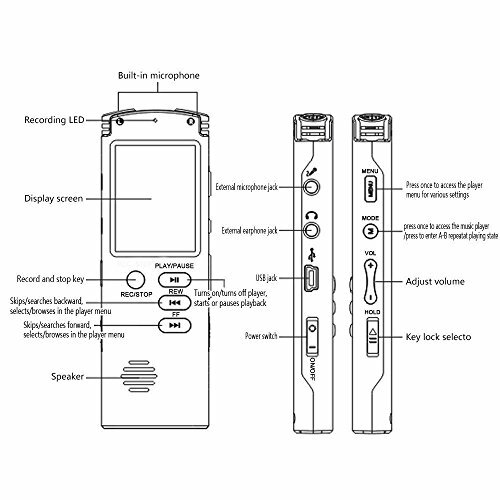 The USB dictaphone is tiny and lightweight, you can record while it’s in your pocket discreetly. 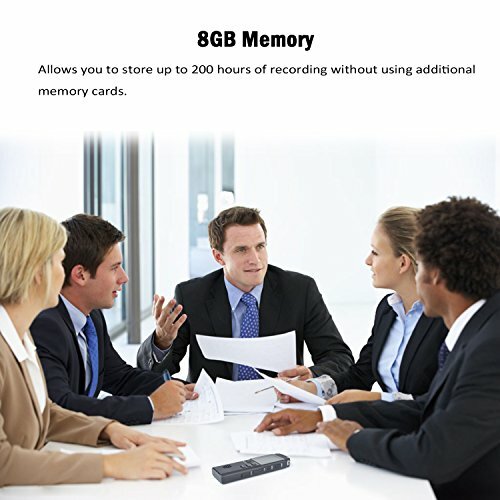 ★ POWERFUL FUNCTIONS: 8GB memory allows you to store up to 100 hours of recording without using additional memory cards. A-B repeat during playback and automatically saving files as MP3 or WAV format. Large LCD display and easy to read. 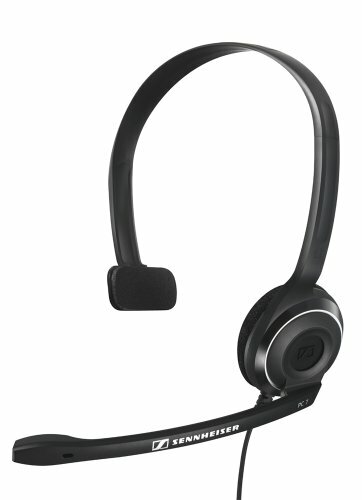 280mAh rechargeable battery supports 12 hours recording and 8 hours WMA/MP3 files/FM radio playing. Too complicated to record voice on your phone? 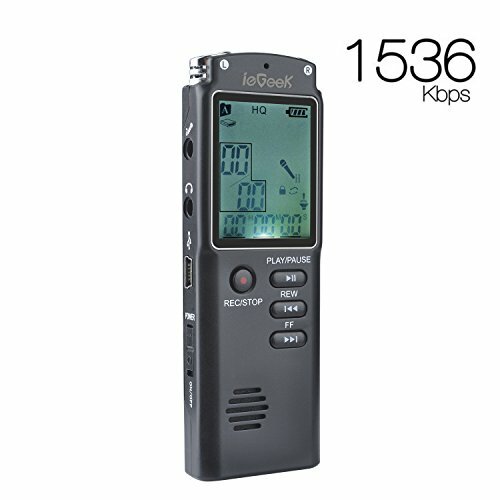 Why not get an ieGeek mini voice recorder? 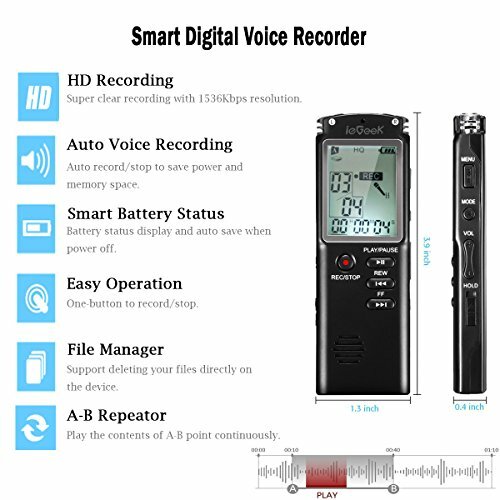 Supported with 3 modes: Digital Voice Recorder, MP3 Player and USB Stick, it’s super easy to record and playback in clear sound. 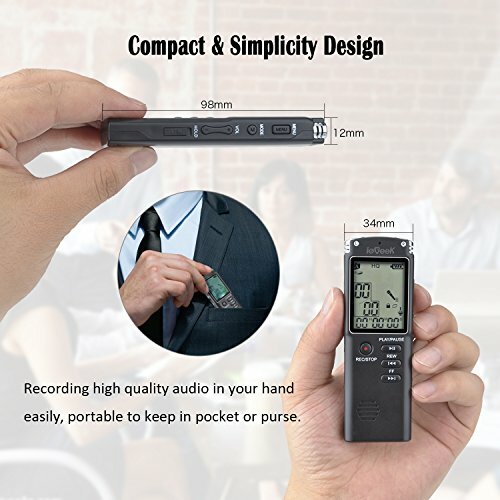 Tiny and compact design so you can record while it’s in your pocket, ON start record, OFF save file, ideal for meeting, class, lectures, conferences, interviews, vocabulary trainer, study, take notes, or enjoy music. 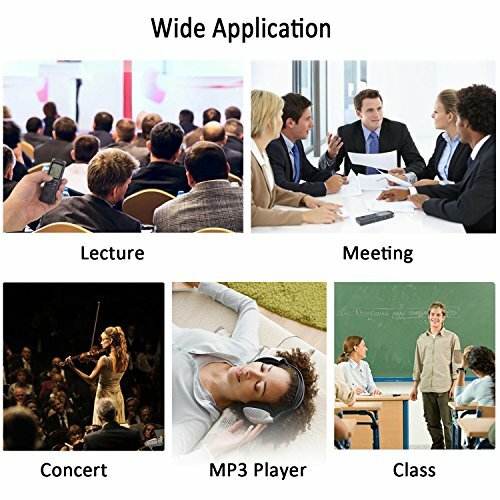 ★ PLUG & PLAY ON PC: 3 Modes supported – Voice Recorder/ MP3 Player/ USB Flash Drive, you can easily transfer files in the audio recorder to PC (NOT for MAC), just connect the recorder to your computer via the supplied USB cable, no additional software required. 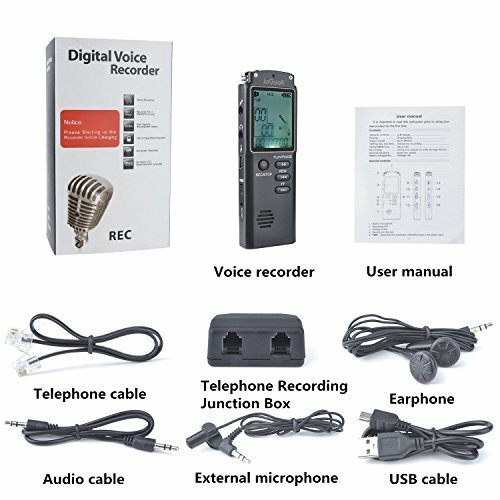 ★ WIDE APPLICATIONS / 1 YEAR WARRANTY: The voice activated dictaphone is great for letures, meetings, interviews, conferences, study, obtaining evidence, discreet & covert recording, etc, makes it a perfect gift for students, writers, lawyers, professionals and any other users who need it! 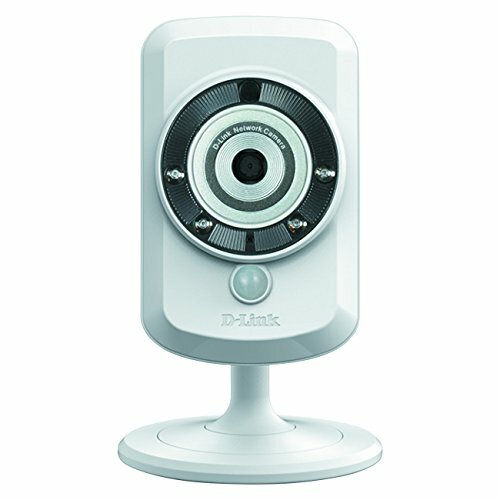 1 Year WORRY-FREE Warranty, purchase with 100% free risk.